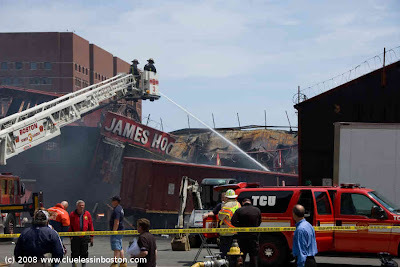 Clueless in Boston: James Hook Lobster Co. 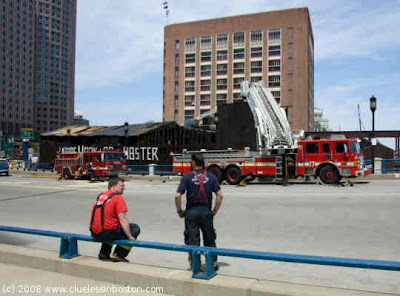 This what is left of the James Hook Lobster Co. on Atlantic Avenue after a fire last week. You can see in the photo firefighters are still watering down the charred remains to make sure it doesn't flare up again. This family business shipped 50,000 pounds of lobster a day all over the world. I posted a picture of its lobster weather vane here last month. Below are two of the firefighters taking a break after fighting the fire all night. Love your shots. . . .Hate that the place is gone. The name sounds familiar. I may have eaten there the last time we were in Boston. Is it an arson or an accident ? Nice shot even if it is so sad to see that. Fires are such destructive things. Fireman though are a different matter. That's a real family tragedy! Firefighters are hot... pardon the pun.